Companies are using both formal and informal learning to educate new and existing employees. However, decreasing the cost of training and increasing employee knowledge retention are challenges for many organizations without the proper resources. In this E-book, discover how businesses - in their own words - have used Brainshark to successfully produce content up to five times faster, boost employee retention and participation rates, and increase compliance. Brainshark corporate training solutions enable your subject matter experts to easily create interactive eLearning and mobile training (mLearning) content. With on-demand video presentations, companies can drive more cost-effective learning initiatives and better prepare employees for job-related activities. With Brainshark On-Demand™ video presentations, you can quickly educate geographically-dispersed audiences with training content and eLearning courses that can be viewed anytime, anywhere – even on mobile devices. Brainshark enables you to save travel costs and time, increase productivity of learners and experts, and expand your ability to meet time-critical training needs. 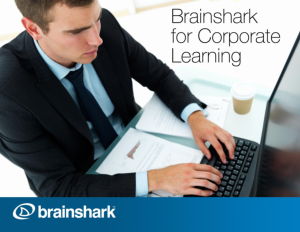 Whether you’re looking to create content for informal learning or develop new resources for your Learning Management System (LMS), Brainshark's corporate training solutions provide a simple way to deliver information quickly to your audience, track completion and assess results.